Hi everyone and welcome to Red Couch Recipes. I hope you have been having a wonderful time with family and friends and you are ready to ring in the New Year. 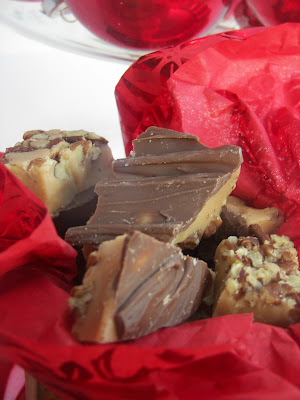 I developed this cake recipe for a Hodgson Mill Holiday Recipe Contest. In the hurry of the holidays, I didn't post it. I love baked goods with whole wheat flour and this one is a gussied up chocolate cake perfect for holiday get togethers. Preheat oven to 350 degrees. Grease and flour 2 (8-inch round cake pans) or line cake rounds with parchment paper and spray with cooking spray. In a large bowl, cream butter and brown sugar. Then add 2 eggs and beat well. In a medium, and separate, bowl, add the whole wheat flour and cocoa together. In a small bowl, add the buttermilk, almond extract, and orange zest together. Then add the flour mixture and buttermilk mixture to the creamed butter and sugar mixture. alternately, starting and ending with the flour mixture. Add to mixture the baking soda. Finally, add the 7/8 cup boiling water all at once and mix thoroughly. Pour immediately into prepared pan(s) and bake at 350 degrees 30-35 minutes..Let cake sit in cake pans for 5 minutes, then move to wire rack to cool. 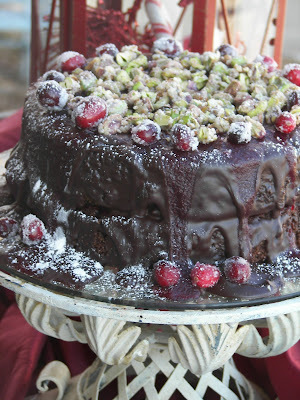 While cake is cooling make cranberry coulis, milk chocolate ganache, and candied pistachios and cranberries. Rinse cranberries with water and place in colander to drain water. Place all ingredients in blender or food processor and process until finely ground. Remove ingredients from the food processor and place in a medium saucepan and cook on medium high heat until mixture is brought to a boil. Reduce heat to medium and cook for about 8 minutes or until mixture is reduced. Cool mixture and then place in fine sieve, with bowl underneath, and strain mixture until only the skins and the peel of the orange remain in the sieve. It is helpful to use a spoon and keep pressing the fruit against the bottom of the sieve. Refrigerate until used. Place chocolate chips in a medium size bowl and set aside. Place cream in a medium size saucepan and bring to a boil. Place cream in the bowl with the chocolate chips and whisk until fully combined. It will thicken quite rapidly. Cool slightly before applying to cake. Place sugar and pistachios in a medium sauce pan. On medium heat, heat the sugar and pistachios until the sugar just barely begins to melt. 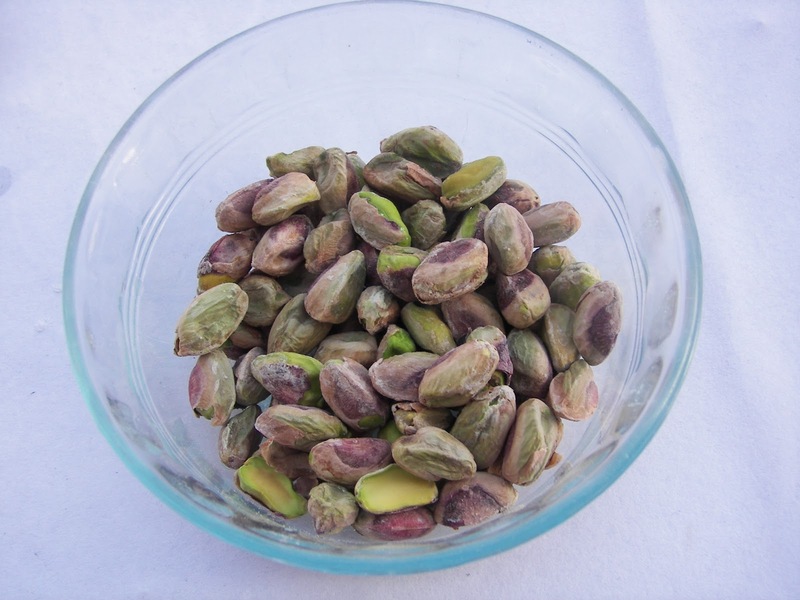 Working quickly, using a heat-proof utensil, quickly cover the pistachios with melted sugar. Remove sugared pistachios from heat and cool. Wash 1/2 cup of fresh cranberries and drain in colander. Roll cranberries in 2 tablespoons of granulated sugar. 1. Working quickly, because the ganache can harden, take one 8-inch cake round and place on cake pedestal or large plate. 2. Spread 1 cup milk chocolate ganache evenly on top of cake layer. 3. Take second 8-inch cake layer and place on top of first layer of cake. 4. Take remaining ganache and pour on top of cake so that it drapes the cake. If ganache has cooled too much, place saucepan back on burner on low heat until the proper consistency has been reached. 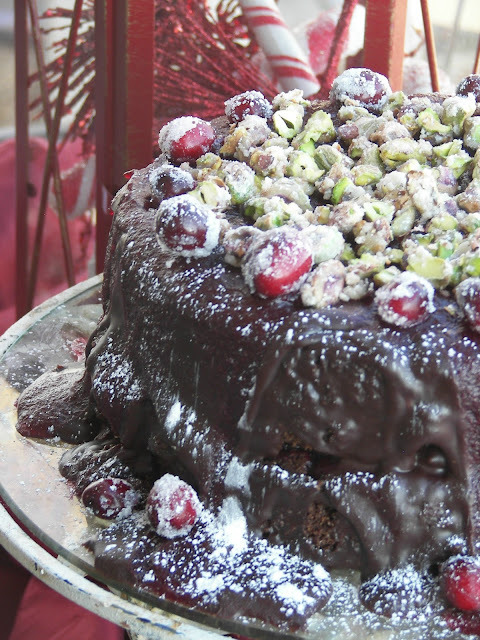 Allow ganache draped on cake to cool and harden. 5. 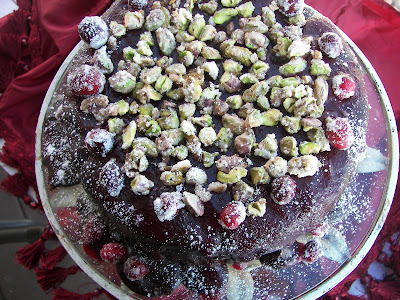 Top ganache with 1 cup cranberry coulee. If desired, allow coulee to drip down the sides of the cake. 6. 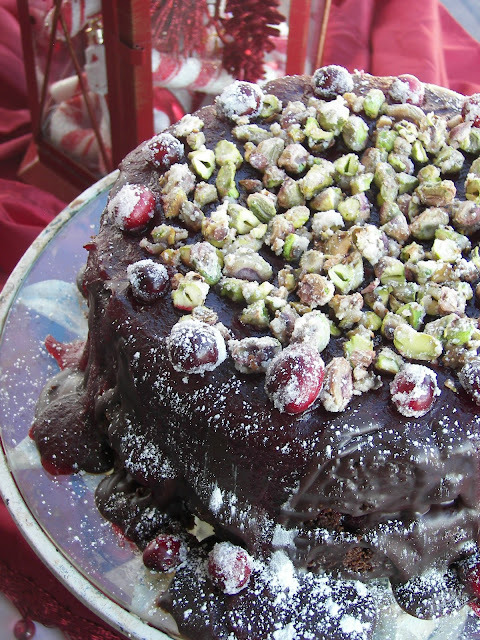 Top cake with sugared pistachios and cranberries and powdered sugar. 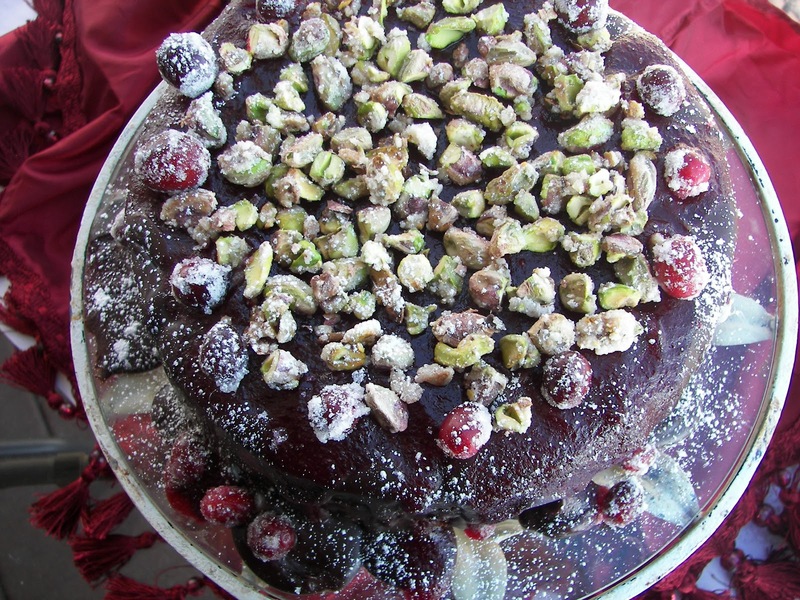 Circle cake with about 16 cranberries on the outer edge of the cake top. In the center of the circle place the candied pistachios. Decorate base of cake with sugared cranberries. Apply powdered sugar by putting a small amount of powdered sugar in small-holed sieve, shake gently over cake to achieve desired effect. 7. Serve slices of cake with cranberry coulis on top. If desired, serve warm, by reheating slices of cake in the oven. We love any chocolate cake heated up, but it is good served cold too! The cake is stunning! Gorgeous! Wow. A winner. I just knew that if I waited long enough, someone (thanks Joni! )would develop a healthy chocolate cake - whole wheat and cranberries...now that has to be healthy even though everything about it says 'decadence'! This looks amazing!!! Happy New Year!! WOW! All my favorites wrapped up in one sweet package. 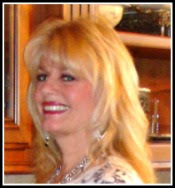 Happy, healthy New Year to you and your family Joni! I bet. That tastes amazing! What a wonderful combination of flavors! Happy 2012, Joni, many blessings! Your cake is gorgeous! 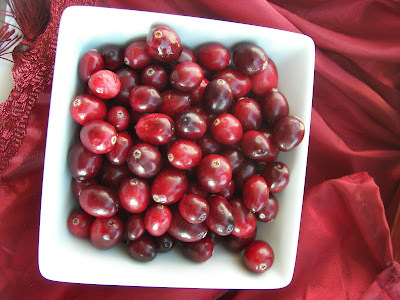 I REALLY want to make something with sugared cranberries~so pretty! A contest winner for sure. Happy New Year, Joni! Amazing! It is gorgeous and I can only imagine how good it tastes. Thanks so much for sharing! Oh my goodness Joni. What a beautiful cake full of my favorite flavors. Happy New Year to you! I loved your comment on my blog. That was Talbot the succulent turtle that you liked ;o) I received him for Mother's Day 2011, and watched him grow throughout the summer. I couldn't resist putting a Santa cap on him so we could enjoy him during the Christmas holiday. Oh good gravy, that looks delicious! Considering the ingredients, I could practically call it health food, right? This looks so yummy Joni! I would definitely be fighting to scrape the frosting off the platter. That topping is incredible too. The colors are so perfect for the holidays. Hope you had a wonderful time for Christmas and New Years.